This week’s Antelope Intros feature two guys who love animals — but very different types of animals. One goes for the cute and cuddly while the other has a passion for the slithery and slimy. Donate to Elevate helps kids like Donovan Welbaum, 15, who otherwise might never have a chance of attending a private school like the Phoenix Christian Preparatory School, where he has good grades and perfect attendance. 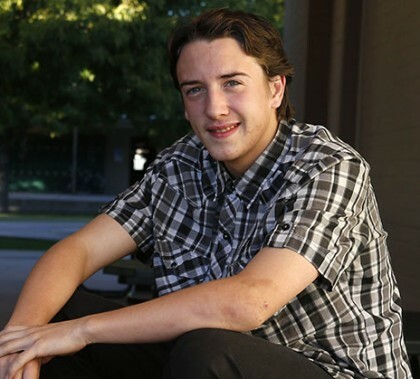 The Phoenix skateboard-loving teen was heading toward a rough life on the street or behind bars when he was offered the chance to apply for a scholarship with the help of tax-deferred dollars through Donate to Elevate. GCU employees have the opportunity to use their tax dollars to support those in need with the Donate to Elevate annual giving back campaign. Colangelo College of Business students learned a lot about the future Tuesday afternoon from AJ Maestas, one of the top sports marketing people in the business, but he also dealt in the present by giving them solid advice about how to get a job after they graduate. “You will have no career in sports unless you take networking seriously,” he told them. Take it from someone who knows how to network. Depictions of war in Hollywood movies aren’t nearly as bad as the real thing, three former government security contractors told a GCU audience Tuesday during a talk on their role in defending the U.S. diplomatic compound in Benghazi, Libya, during a terrorist attack in 2012. Marine Corps veterans Mark “Oz” Geist and John “Tig” Tiegen, and former Army Ranger Kris “Tanto” Paranto talked about the 13 hours of mayhem at the compound which inspired a book and an upcoming film. 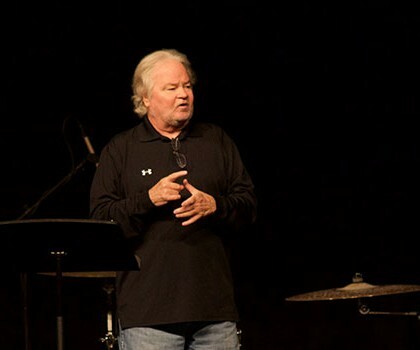 Tom Shrader turned a simple message — that God loves each of us unconditionally — into a much deeper discussion Monday morning at Chapel when he broke down how much that differs from the way human beings practice love. God loves us no matter what we do, Shrader said, and it’s up to us to return that love by getting closer to Him through repentance and faith. When Raj Sisodia, one of the leaders of the Conscious Capitalism movement in the business world, came to GCU Monday, he did more than just share some important statistics and his beliefs: He told the huge audience in the Student Union that Millennials are “the most meaningful and purposeful generation we’ve ever had.” Dr. Randy Gibb, dean of the Colangelo College of Business, has made it his mission to incorporate Conscious Capitalism ideals into the CCOB curriculum, and getting such an authoritative speaker on campus was a huge victory. Arguably the best newspaper in the world, The New York Times, featured the work of GCU graphic designer Jessica Foncannon in an article last week about the power of playwright Arthur Miller’s plays in modern design. Foncannon’s work on “My Three Sons,” a play that will be presented in February by the College of Fine Arts and Production, was among eight designs capturing the eye of Times writer Erik Piepenburg, and the only one representing a University. This week’s Antelope Intros feature a new employee who’s always cookin’ up something good — fun trips and hikes, yummy recipes and, most important, a ready smile. Our other introduction is an admissions rep in San Diego who loves the beach but has a great time when he visits the Valley, too. Colangelo College of Business students continue to do the job when they go up against other universities in local competitions. Teams from GCU finished second, fifth and seventh among college teams in the Stock Market Challenge, and seven GCU students placed in the top three in the Collegiate DECA Fall Leaders Conference, which was on campus.